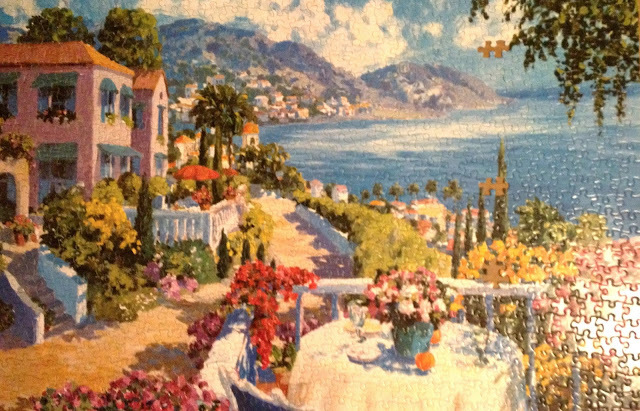 Today I finished the Julian Askins 750pc Lake Side View puzzle that has been sitting around the house for a while. Everyone and their brother has worked on it and we knew it was missing pieces. Well today we found it is missing three pieces. This puzzle was shipped down from Michigan and was crushed inside the larger box and our neighbor actually found a piece or two in the street and figured they had to be ours. So, I think I will try my puzzle piece repair technique I thought up when we thought we were missing pieces for Rizzy. I will let you know how it goes! When I started today, the sky and water was not done, I always try and do the hard parts for M so she can enjoy the puzzle more. 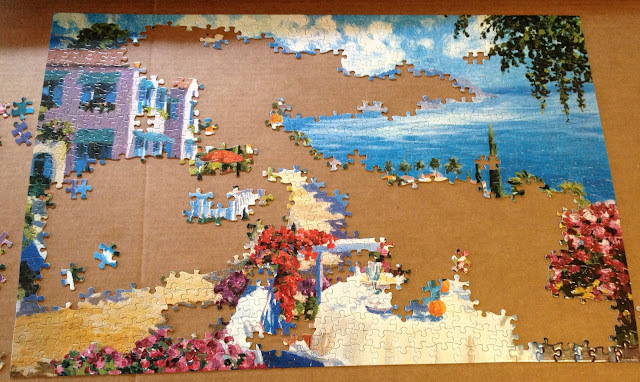 She however, was too hung over all day from the Sangria I made last night for Tessa's birthday party to puzzle at all so I just went ahead and finished it. Julian Askins' Lake Side View Finished but not complete. As you can see, its missing three pieces, strangely enough, they are all in the same row. How will the fixing go? Stay tuned. This one will be a good test for your puzzle piece re-creating technique. Can't wait to see how it turns out. Check out the latest Penny, lost pieces recreated!